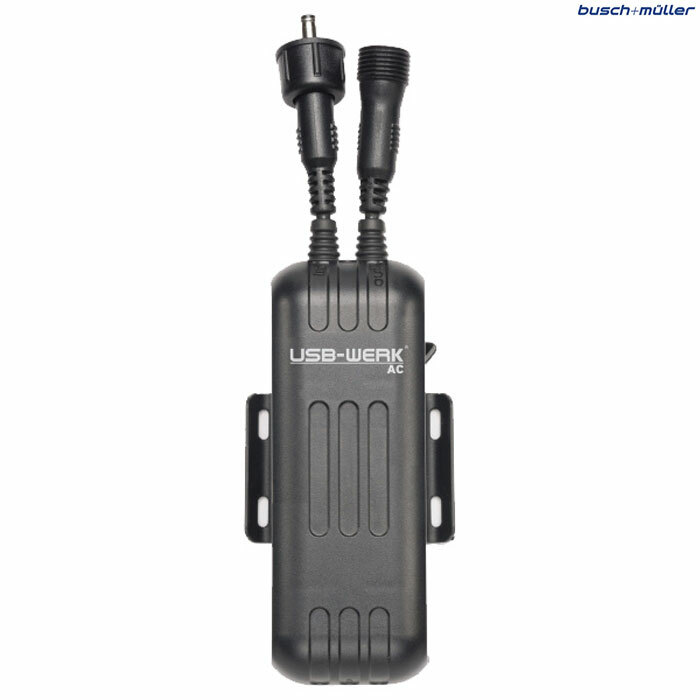 Busch & Muller have designed the USB-Werk with an integrated cache battery. It supplies 5V and up to 1A current. The battery ensures a constant voltage supply during slow riding and / or stops. For this reason the USB-Werk is a perfect fit for charging / powering USB devices such as mobile phones, GPS, MP3 player. The unit is supplied with cable and USB socket. I ran this with a light and to charge my phone or spare battery. I was using an iphone6 with the light on most of the time. If you keep the speed up it works. Over time the phone charge would reduce to the point it would go into low battery mode. At this point if moving enough it would maintain charge level. Through town inevitably the battery was drained. This was all using an SP style dunno hub to power the iphone using google maps to navigate. Using this with one small backup usb battery if needed in town and the phone charged it would last a full days riding. It was simple to fit and didn’t give any problems. Basically with it be powerful enough with a constant voltage to charge up something so large? As we have never tried to use this with something so large we would have no idea if this would charge or not I'm afraid. Your website says the E week can't charge iPhones. Can the USB werk? As the output is regulated at a fixed amp rating on the USB Werk it is indeed suitable for use with IPhones. the charging device will need to be wired directly into the dynamo as the rear output from the front light will not be sufficient to charge it. Depending on your dynamo you should be able to wire the light and charging device directly into the hub using piggy-back connectors. Should I Disconect My Usb Werk When Not In Use? We would recommend if possible disconnecting the USB Werk from the hub when not in use as it will still provide extra drag to the rolling of the hub. It is however completely up to you if you remove it completely from the bike, this would take longer for removal and re-instalment but would mean that you didn't have an electrical device and wiring sat on your frame exposed to the elements when its not even being used.